Is Cottage Cheese Good for You to Lose Weight? 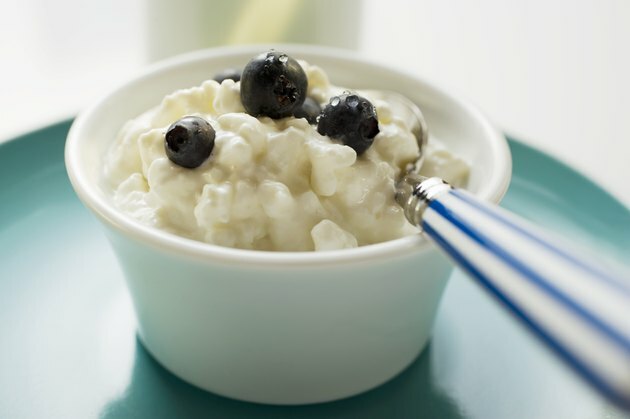 It may be a little retro, but cottage cheese still makes a good addition to any weight-loss diet. Low in calories and filled with satiating protein and bone-building calcium, cottage cheese may be a dieter's dream food. And as part of a reduced-calorie diet, it may help you lose some of those unwanted pounds. If you're looking for a protein-packed entrée or side dish you can eat plain or dress up, consider giving cottage cheese a try. Calories are the most important part of any weight-loss plan. In order to lose, the number of calories you eat every day should be less than what you burn. Calorie needs vary depending on age, gender, body size and activity. Most inactive women can lose on 1,200 to 1,500 calories a day, and most men and active women lose on 1,500 to 1,800 calories a day. Cottage cheese calories vary depending on fat content, with full-fat versions containing 220 calories per cup and nonfat versions containing 100 calories per cup. On a weight-loss diet, the nonfat version makes the most sense because it has the smallest number of calories in the same serving size. But if taste is an issue in the nonfat version, you may find the low-fat version -- 1 percent fat -- a happy medium with 160 calories per cup. You've probably heard eggs make a good breakfast when you're trying to lose weight because they keep you full. Cottage cheese may work just as well as eggs, according to 2015 study published in Appetite. This study, which compared the satiating power of eggs vs. cottage cheese in a small group of volunteers, found that they both helped control hunger and concluded it was related to the protein. Like the calories, the amount of protein in cottage cheese varies depending on the amount of fat. A 1-cup serving of full-fat cottage cheese has 25 grams, low-fat has 28 grams and nonfat has 15 grams. Getting 25 to 30 grams of protein at a meal may be the target number for appetite control and weight loss, according to a 2015 review article published in the American Journal of Clinical Nutrition, making the low-fat cottage cheese a good choice. Upping your intake of protein also helps preserve muscle while you lose the fat on your weight-loss diet. Muscle burns more calories than fat, and keeping more of it while you lose weight may limit a slowdown in your metabolism. Dairy foods like cottage cheese are a good source of calcium, which is not only good for your bones but your weight as well. A reduced-calorie diet rich in dairy foods helped obese people lose more weight and fat than those following a reduced-calorie diet with calcium supplements and a reduced-calorie diet with a standard amount of calcium, according to a 2004 study published in Obesity. Calcium from dairy foods may help stimulate fat-burning and suppress fat accumulation, according to the researchers. Calcium content in cottage cheese varies, with 187 milligrams in a cup of regular, 138 milligrams in a cup of low-fat and 125 milligrams in a cup of nonfat. In the 2004 study, the high-dairy group got 1,200 to 1,300 milligrams of calcium a day from various dairy foods. While cottage cheese may not be as rich in calcium as yogurt or milk, it can help you meet your needs. For overall good health, adults need 1,000 to 1,200 milligrams of calcium a day. While you can eat cottage cheese plain, its mild flavor makes it a versatile ingredient that pairs well with a lot of different flavors. If you're trying to limit calories, sprinkle a little cinnamon or nutmeg on your cottage cheese. If you prefer mix-ins, sliced bananas or berries go well. Of course, you can also go with the traditional crushed pineapple or sliced peaches, too. But you don't have to limit yourself to sweet additions. Use cottage cheese as a dip for baby carrots and celery sticks, or stir in cucumber slices and cherry tomatoes. It also makes a tasty high-protein topper for your baked potato. Or, instead of part-skim ricotta cheese, which has 340 calories per cup, use nonfat cottage cheese in your next pan of lasagna to save about 20 calories per serving.